Bikaner Urban Improvement Trust has declared a date for holding a lottery result of UIT Bikaner Swaran Jayanti Vistar Yojana. 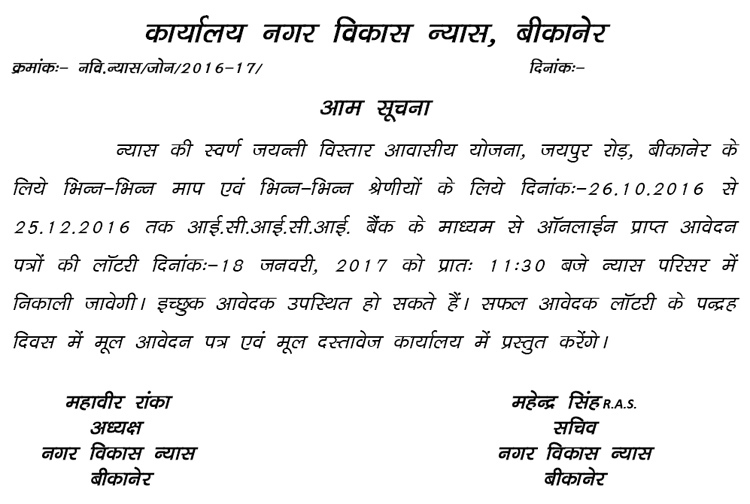 UIT Bikaner will hold a draw result of residential plots under Swaran Jayanti Vistar Yojana on 18 January 2017. Under the scheme, UIT offered residential plots for online applications were invited through ICICI Banks and registrations were opened from 26 October to 25 December 2016. These residential plots were available for all categories of the society. Link for obtaining the list of applicants is available on the official website of UIT Bikaner. UIT Bikaner requests all registered applicants to attend the lottery program for the allotment of plots in Swaran Jayanti Vistar Yojana and the program will begin at 11:00 AM.